SAFARI JOE… DOES IT AGAIN! I love the Thundercats toys. If any toyline deserves another run and a movie or new tv series with toyline (not internet exclusive crap like MOTUC) its Thundercats. Haha,I had this toy,he was shelfwarming 10 years later.Always wanted him to have a revolving gatling gun but it was a soft sculpted lump instead. Man, if the Horsemen got their mitts on this license… bliss. I had all the Thundercats toys as a kid and would love the 4H to bring them back. 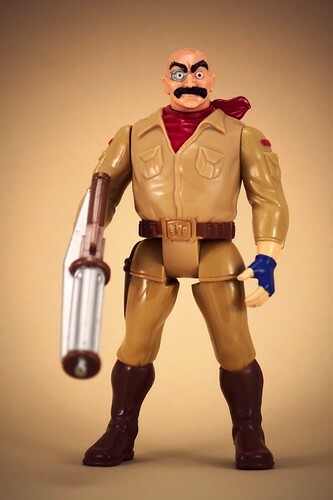 But does anyone else think Safari Joe looks a bit like the Sarge from Mad Max? @MechaShiva: He was deffinently a peg warmer, I got him in 92, although the show was still on over here at the time, still have him along with all the others. I would love the 4H to do them….but can't really say I want Matel to do them….as I said if its not a proper toyline in shops or at a regular affordable price I am not interested.